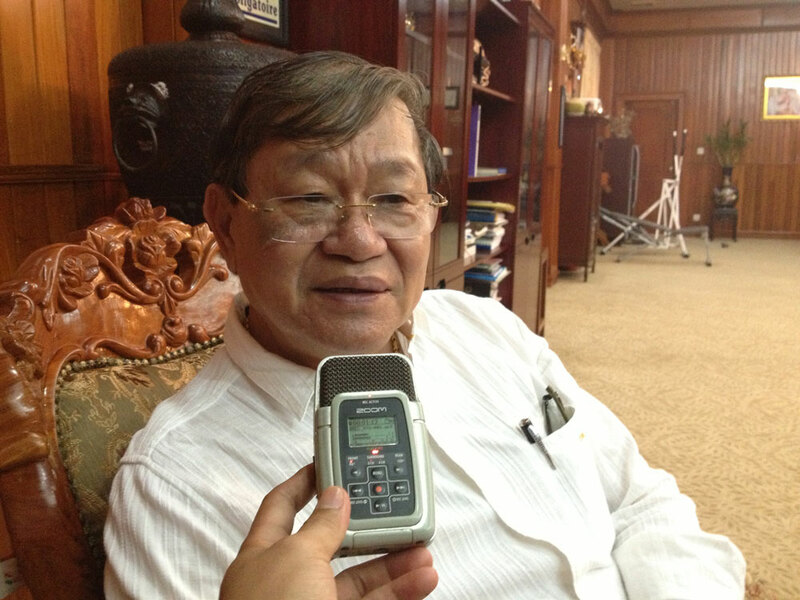 Khieu Kanharith speaks to RFA in Phnom Penh, Jan. 15, 2014. The Cambodian government moved on Friday to sharply restrict the airing of foreign movies on television, calling the move a necessary step to encourage the work of local filmmakers and promote national culture. The Ministry of Information order, which will take effect on Nov. 1, bans the broadcast of any foreign-made film between the hours of 7:00 to 9:00 p.m. and is intended “to restore Cambodian culture and Khmer movies,” a government statement said. During that two-hour period, all television stations must instead broadcast Cambodian movies, traditional music, and sports, and any station not complying with the order will be stripped of its license, the statement warns. A reporter’s e-mails seeking comment from Information Minister Khieu Kanarith, who signed the order, were not answered on Friday. Speaking to RFA’s Khmer Service, Khmer Artist Association president Sos Mach welcomed the move, saying that his association had worked with Cambodia’s Ministry of Culture to request the ban. “Those foreign movies affect our economy, education, and culture, with Thai movies now being aired by almost every station,” Sos Mach said. “This has seriously impacted the Cambodian movie industry,” he added. Cambodian filmmakers should use this opportunity to produce movies and sell them to local television stations, said Sos Mach, who works professionally as a popular singer. He added that he will now watch those stations closely to see if they comply with the government’s order. Cambodia’s people should be free to choose which films to watch, though, said Ou Virak, president of Future Forum, a local policy research group. “This is an extreme move to encourage Cambodian artists, but the government should allow people to see what they like,” he said. Though the quality of Cambodian-made movies “has been getting better,” the government also recently banned a domestically produced film on the subject of human trafficking, Ou Virak noted. “I am afraid that the government may use this ban to further restrict people’s freedom,” he said. Reported by Oum Raingsy and Samean Yun for RFA’s Khmer Service. Translated by Samean Yun. Written in English by Richard Finney. Autocratic thuggery is all these old Khmer Rouge ... understand. First eradicate an entire culture, then cram what little of it that has survived down everyone's throat...Hun Sen, let your people, a very clever people, be free. Does sound like what the Communist China does?